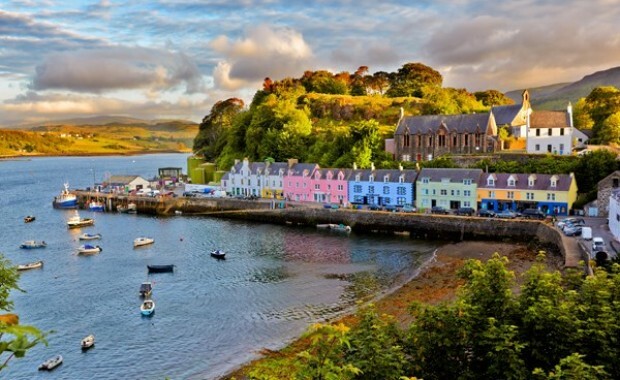 If you like to explore little discovered parts of the UK and like coastal areas, wildlife, history and even birdwatching, these tiny islands are outstanding areas of beauty and fantastic places to have a day out in the UK. During its heyday in the 19th century, 450 people populated the island and the main trade was slate roof tile exportation. Today, the island has no roads, therefore no cars, so everything is moved using good old-fashioned wheelbarrows. There are pretty whitewashed cottages near the harbour and now the quarries, which were once filled with slate, are now lagoons surrounded by long grasses and wild flowers. There are 71 inhabited houses, 30 of which are taken by permanent residents. There is a pub, restaurant, museum hall and the Coalree which is used as a workshop. You can stay at one of our three hotels in Scotland on the way to visiting Easdale. Samson is a stunning island with a very Caribbean-esque feel due to its bright, clear water and white beach and measures 0.15 square miles, but do be aware it doesn't have the same climate as the Caribbean! The island hasn’t been inhabited permanently since 1855 and the main residents of the island are 2000 seabirds which nest there every year. The island has been featured in numerous works of fiction including Why the Whales Came by Michael Morpurgo and The Dangerous Island by Ann Bridge. You can visit the island by boat from the Isle of Scilly and see the remains of old stone cottages and take a guided walk around the island. If you like taking photos this is a great place to get some nature shots, especially of birds and the stunning white coastline. Worm’s Head is a mile long and juts out of the Bristol Channel and is a simply stunning piece of landscape. Belonging to the National Trust, the views are fantastic if you walk around the edge of the head which should take about 15 minutes. Worm’s head is shaped like a sea serpent and is written about in Dylon Thomas’s short story Who Do You Wish Was with Us? It is a breeding ground for a variety of birds including Razorbills, Kittiwakes and sometimes Puffins. There is a National Trust centre and shop and you can enjoy amazing views from every angle of the wiggly worm. This tiny tidal island can only be reached during certain times of the day when the tide is out. If you are lucky enough to reach it you will find wild asparagus, flowers and fruits growing there. It is located next to Kynance Cove which is a hugely popular place to visit with parts of the TV adaptation Poldark being filmed there amongst others. Asparagus Island also has a blowhole which makes some very interesting sounds at mid-tide! This small tidal island located in Mount bay in Cornwall has a castle, a chapel and an underground railway which transports goods from the harbour up to the castle. It is one of 43 tidal islands which you can walk to from mainland Britain and has eight houses where members of the Castle staff live. A number of films have been shot here including James Bond's Never Say Never Again and Dracula.